A recipe using the first cutting from our own rhubarb! One of the best things about late spring is the arrival of fresh strawberries and fresh rhubarb. 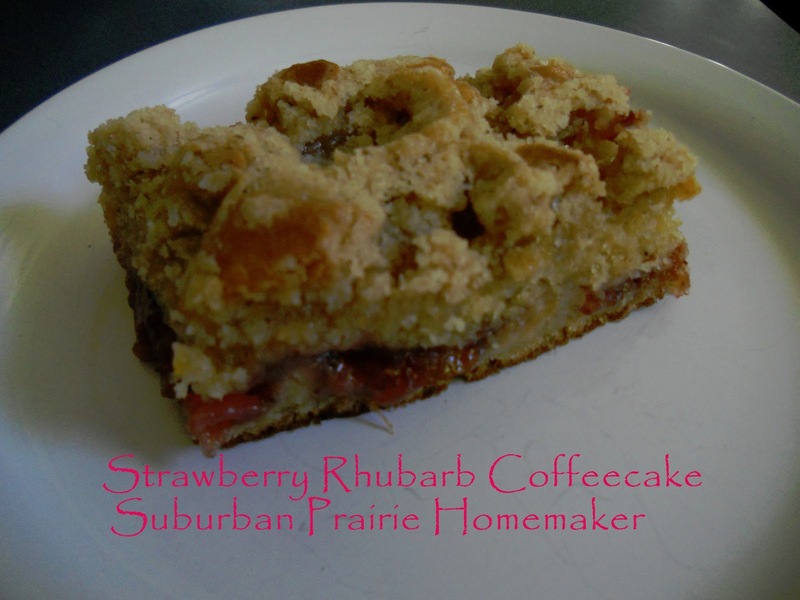 These two were made for each other, the sweetness of the strawberries complementing the tartness of the rhubarb. And since the kids and I are total rhubarb addicts, we finally planted our own plants in one of our perennial beds a few years ago. Rhubarb is one of those plants that needs some time to really develop and grow before you can harvest it, usually about 3 years. We started with 2-year-old root stock, but with the horrible drought last summer, I waited until this year to harvest it. If you decide to grow your own, be sure to dig a large enough hole to accommodate a healthy portion of composted manure. My farmer grandma said you can't grow good rhubarb without cow manure in the hole. Since we don't have a cow, we used bunny beans from one of our rabbits. It did the trick just fine. In fact, I once met a woman from Alaska who used moose manure when she planted rhubarb. The point is to just use some type of composted manure. Also, when you are ready to harvest your rhubarb, never cut more than 1/3 of the stalks. If you hack the plant half to death, it won't grow well in the future. If your plant should bolt (aka go to seed), just cut out the stalk with the seed head on the top. The plant is still good to eat, and will focus its energy into growing the stalks rather than making baby rhubarbs. So I'm sure you're ready for the recipe, right?! In a medium mixing bowl, combine sliced strawberries and 1/2 cup sugar. Let the strawberries macerate (which is a fancy word for sitting in a bowl and letting the sugar pull out all those yummy juices) for about half an hour. Preheat your oven to 350. Grease a 9 x 13 pan. In a large saucepan, combine rhubarb, macerated strawberries, and lemon juice. Cover and cook over low heat for about 5 minutes. Be sure to keep an eye on your pan - it has a tendency to boil over. This is one sticky mess you don't want to have to clean off your burners. Trust me on this one. In a small bowl, combine remaining sugar and cornstarch. Stir into mixture in the saucepan. Bring to a boil, cook and stir for about 2 minutes, or just until thickened. Remove from heat and set aside. In a large bowl, combine cake mix and 1 cup of pie crust mix. Beat in milk, eggs and vanilla. Carefully pour about 2/3 of the batter into the 9 x 13 pan. Now, here's my trick for adding the strawberry filling. Use a large spoon or spoon-type rubber spatula. Scoop up a spoonful of filling, and finesse it into place on the cake batter by gently GENTLY shaking the spoon so the filling slides onto the batter. Some places may have a little more filling than others, but that's ok. When your mouth is full of delicious coffeecake, you won't care. Use this technique until the top of the cake batter is pretty evenly covered. Then pour on the rest of the cake batter. For the topping, combine the 1/4 cup of melted butter, reserved cake mix, and reserved pie crust mix. Crumble the mixture over top of the batter. Place the pan on the middle rack in your oven, and wait patiently for about 40-45 minutes while it bakes. Ok, maybe not so patiently because it's really good, but you get the idea. Test with a skewer to be sure the center is baked. You'll get strawberry filling, but you should not get anything else. Once it's done, remove it from the oven and allow to cool. Cut into squares, and serve. Feel free to top with whipped cream or a dusting of powdered sugar. Why the pie crust? I happened to be out of gluten free all purpose flour. Think about what a pie crust is made out of - all purpose flour and some type of fat (butter, lard, margarine, etc.). This is why I say over and over again - know your ingredients. It's not just about searching for hidden gluten, it's about knowing how things are made in case you get in a bind like I did. So yeah, that pie crust mix was an easy substitute that came straight from the pantry. If you don't have pie crust mix on hand (and you should - Breads from Anna mixes are AMAZING! ), use a good gluten free all purpose flour. And I'm sure you're ready for some other ideas, right? No cornstarch? No worries - cook your strawberry and rhubarb mixture until it releases the juices, then add strawberry jam. Just be sure to only use the 1/2 cup of sugar you used for macerating the strawberries. This would be especially good with an all fruit jam. No rhubarb - no problem. Use other berries. No strawberries? No sweat - use raspberries. Strawberries and rhubarb out of season? Make it with cherry pie filling. Or use apple pie filling, and add either cinnamon, apple pie spice, or pumpkin pie spice to the topping mixture.